COLUMBUS – The Ohio Veterans Hall of Fame is accepting nominations to recognize those who served in the U.S. Armed Forces and continue to contribute to our communities, state and nation through exceptional acts of volunteerism, advocacy, professional distinction, public service or philanthropy. 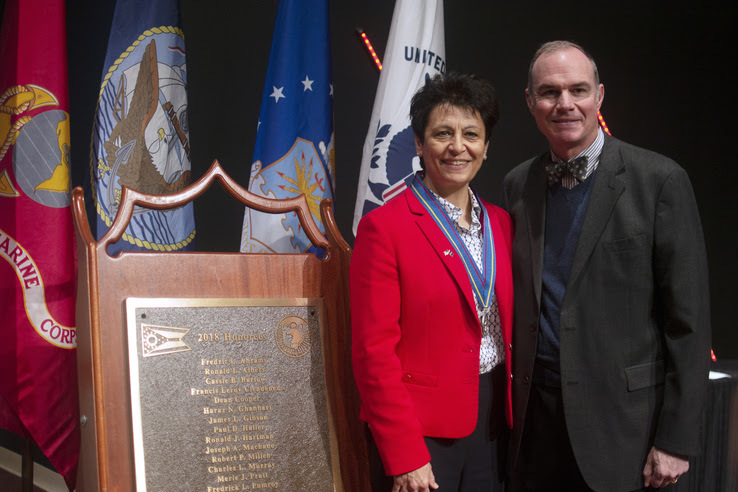 Each year, the Hall of Fame inducts up to 20 veterans based on recommendations from an Executive Committee of veterans from throughout the state and approval from the Governor of Ohio. This Hall of Fame sets the standard for recognizing Ohio’s veterans for accomplishments beyond their military service. In addition, it is a fitting way to say “thank you for your service to our nation and thank you for your continued service to our communities.” Chances are you know a veteran who deserves to be inducted into the Ohio Veterans Hall of Fame. You are encouraged to nominate that deserving veteran today. Nomination deadline is June 1, 2019. Guidelines, a sample nomination and more information are available at http://dvs.ohio.gov/main/veterans-hall-of-fame.html. Stay warm and safe tonight. Post 539 Membership Drive coming! American Legion Post 539 in North Baltimore, Ohio will be conducting a Veteran membership drive for all veterans, active duty, retired, that are not current members. On 2 February, from 3 PM – 6 PM, the Post Service officer will be present to answer questions about the Legion Post and what we do as an organization. Any veteran wishing to join will get their first-year membership free and first drink free. Just bring your DD-214 and we will do the rest! You can donate blood on Friday, November 23rd at the North Baltimore American Legion. This event is sponsored by the Briar Hill Health Campus to support the American Red Cross. For the NBHS Veterans Ceremony this year, the National Honor Society is updating their slideshow. If you have any veterans or service members among your family and friends that you want included in the slideshow, please email pictures to Hannah Main at hannahmain19@northbaltimoreschools.org. The original slideshow from last year was preserved, and we are only looking for new additions or updated information. Please include the name first and last of the individual(s) in the photo, what branch of the service they are affiliated with, and their years of service (if possible). Pictures will be accepted through Wednesday, November 7th. The Veterans Ceremony will take place on November 9th in the MS/HS Auditeria. Guests are encouraged to arrive at 2:00 p.m., and the ceremony will begin at 2:10 p.m.
North Baltimore Middle/High School is hosting a Veteran’s Day Ceremony on Friday, November 9th, from 2:10 – 2:40 in the auditeria. National Honor Society is sponsoring this event to express the importance and value of North Baltimore’s service in the military. We wish to invite all veterans and current active members of the armed forces to the ceremony. Service men and women will be honored during the ceremony. Anyone able to dress in uniform is encouraged to do so. We also invite parents and community members to attend as our guests. Patriotism is a value taught in North Baltimore Schools, and your attendance would be greatly appreciated! Please RSVP to Dr. Bob Falkenstein at 419-257-3464, or bfalkenstein@nbls.org so that we may plan for your arrival. Learn about the United States Military Service Academy nomination and appointment process for the 2018-2019 academic year. BOWLING GREEN, OH – Congressman Bob Latta (R-Bowling Green) invites all interested high school students and their parents to attend an informational meeting at Owens Community College – Findlay Campus on Wednesday, September 19 at 7 p.m. to learn about the United States Military Service Academy nomination and appointment process for the 2018-2019 academic year. Students seeking an appointment in the future – and their families – are also invited to attend. Applications and additional information are available on Congressman Latta’s website here. Applications will be due October 1, 2018. A couple of activities at North Baltimore American Legion Post #539. The American Red Cross is holding a Blood Drive in the Community Room at the legion hall on American Legion Drive. This evening the Ladies Auxiliary will be holding a B – B – Q. Stop down to give blood or support the auxiliary! North Baltimore conducted the Annual Memorial Day Parade and observances at local cemeteries. North Baltimore conducted the Annual Memorial Day Parade and observances at local cemeteries. Mr. Robert Van Horn (left) was the honored speaker. Ceremony Honoring Memory of those who made the ultimate sacrifice. Thank you to all who participate in the event! They will be burning the American flag across the country this Memorial Day weekend—not in protest but out of respect. It’s the proper way of disposing of a flag that is no longer in a condition to be a fitting emblem. WASHINGTON, DC, May 25 – They will be burning the American flag across the country this Memorial Day weekend—not in protest but out of respect. It’s the proper way of disposing of a flag that is no longer in a condition to be a fitting emblem. North Baltimore American Legion Post #539 will conduct the Annual Memorial Day Parade on Monday, May 28. This information is shared from previous Decoration Day events… Awaiting up dates from the legion! Those interested in participating are asked to meet at the Village Hall on North Main Street at 8:45, with the parade stepping off at 9:00 am. The parade travels south on Main Street, through the roundabout and east to the Maplewood Cemetery for the memorial service. ____________________ is scheduled to be the speaker for the event. A prayer will be offered by _____________________. The Veteran’s Prayer will be offered by ______________, along with comments by Post Commander __________________. The North Baltimore Scouts will put flags on the mound to honor the unknown soldiers who died. Thanks to Dawn’s Flowers for the donation of the wreath. Thanks to Briar Hill Health Campus for the bus in the parade to transport the firing squad to the New Maplewood and Weaver Cemeteries. A trolley from the Wood County Fair Board will be in the parade to transport veterans. The legion will be having a potluck, for participants, after the Weaver Cemetery Memorial, so everyone please bring a hot or cold dish, plus dessert, to the Legion Banquet Room. Everyone is asked to turnout to honor our veterans. Please come downtown for the parade, then follow to the Rocky Ford bridge, for the Wreath Ceremony and then assemble at Maplewood Cemetery, for the prayer, speakers, commemorations and memorials. The Memorials continue at New Maplewood Cemetery and Weaver Cemetery, in Bloom Township.